Lenovo is very serious to develop various variants of Android smartphone. Now you can try out a unique model, Lenovo Vibe P1 Turbo. 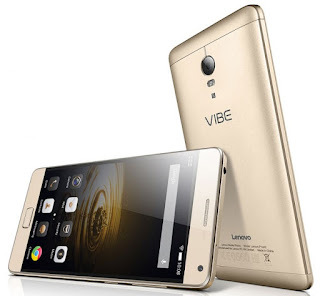 The Vibe P1 Turbo will be exposed as key features, such as large-capacity battery of 5000 mAh which promises a standby time of up to 30 days. 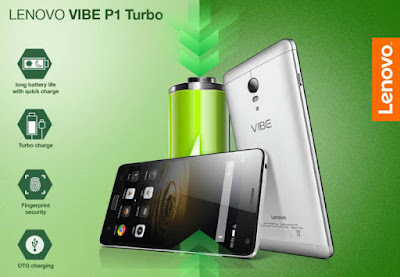 The Vibe P1 Turbo can you maximize as POWERBANK to charge other gadgets. With large capacity, you do not have to bother to always recharge your battery. The Turbo reinforced with Octa-Core 64-Bit Qualcomm Snapdragon 615, which is equipped with 3GB RAM, 32 GB internal memory which is expandable via microSD card up to 128GB. The Vibe P1 Turbo also has great features, a fingerprint sensor located at the bottom of the screen. Lenovo has made this new smartphone comes with the most advanced features available at this time. The Lenovo Turbo is equipped with a 64-bit processor Qualcomm Snapdragon 615 octa-core speed of 1.5 GHz and 3GB of RAM, which allows users to run more than one application, surfing the Internet, streaming video, and play the latest games simultaneously. The P1 Turbo has a 5.5-inch screen capable of displaying a resolution of 1080 x 1920 pixels with a pixel density of 401ppi, so it is very convenient when you use to watch videos, photographs or play the latest games. You will enjoy the bright colors and brilliant. This smartphone screens also have a layer of Corning Gorilla Glass 3, which will ensure the screen can be protected from various forms of scratches due to Human Error or inadvertently bumped. Lenovo P1 Turbo is equipped with a rear camera with a resolution of 13 Megapixel (4128 x 3096 pixels) with a variety of attractive features such as phase detection autofocus, dual-LED (dual tone) flash, panorama, HDR, and you can use to create video Full-HD 1080p @ 30fps. If you want to take pictures selfie, the P1 Turbo has provided a front camera with a resolution of 5 megapixels. Meanwhile the main camera has been enriched with autofocus quickly PDAF complete with Dual LED Flash. With a variety of features, you are ready to make pictures of bright and brilliant easily and quickly. For the safety of your personal data such as documents, photos or videos, then Lenovo is very concerned about the security aspects in the P1 Turbo. This new smartphone has been equipped with a fingerprint sensor features. At this smartphone fingerprint sensor embedded in the Home button. On the button you can open the screen, which will make you feel more secure. If you are a very mobile and busy, you definitely need two SIM cards, and Lenovo Vibe 1 Turbo has been prepared with Dual SIM (Nano). In addition to ready with 2G and 3G connectivity, this sleek smartphone is also ready with a 4G LTE connection. You only need to select the 4G LTE SIM card of your favorite operator. As an advanced smartphone, the Turbo also has GPS, GLONASS and AGPS. If you look at the aspect of a large battery capacity, the Lenovo Vibe Turbo P1 is the main competitor of the Asus Zenfone Max, Gionee Marathon M5, Oukitel K6000, Doogee Homtom HT6, Infinix Hot Note or Motorola Moto X Play. That is most interesting for you to use as your new companion? To answer this question, you only need to compare on the Internet, and use the well-known search engine to obtain the most precise information.